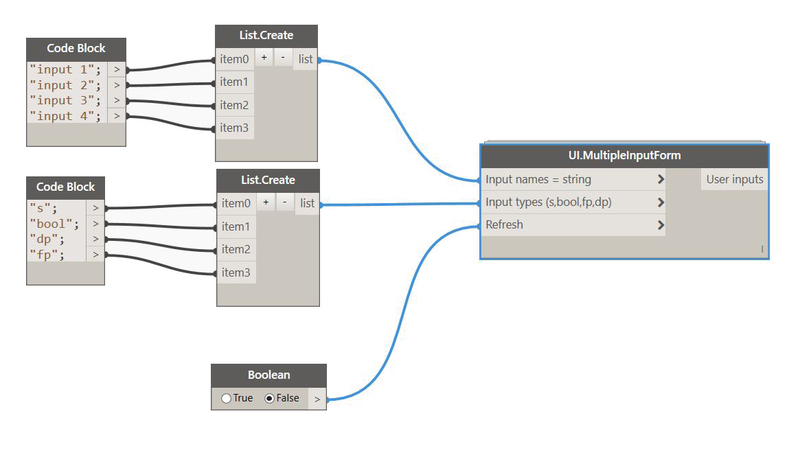 One of the main issues when trying to implement Dynamo into your office workflows is the user interface. Don’t get me wrong, I love it. But not everybody does. So, I have been seeking ways to create a user interface that would be more conventional, in order to make it easier for a larger number of people to benefit from the power of Dynamo. The recent implementation of Dynamo Player in Revit 2017.1 brought us closer to achieving this, but the user input options are still lean. These past couple of months, I spent a lot of time getting familiar with the revit API. Unfortunately, the only dialog box it offers is the TaskDialog, which doesn’t allow much. Recently, I saw a post on twitter that showed how winforms could be created via IronPython, I found this pretty exciting. And with John Pierson’s latest addition to his Rhythms package I was convinced that it was possible, and not so complicated. Edit: there has been an update with more input types! See more here . The list of input types consists of a list of strings that will define the kind of input shown in the form. I aim to replace this by a drop down list node with the input types. It’s going to take zero touch nodes, which I’m not yet very familiar with. You can add as many inputs as you want! I hope this node is useful in getting more people to accept using dynamo. It’s just trying to fill the gap until the Dev Team or another user comes up with something much better. Feel free to comment if you have any suggestion for improvement! I am searching/Trying to create this node from last 6 month. You resolve all my problems, Great work. excellent, but if there are other ways to input like selecting , it’ll be more perfect. you can select elements, faces, edges, and use drop down lists. It’s all in version 2016.11.15 of the package. Wonderful, it’s extremely useful. Thank you. Is there a way to adjust the size of the dialog box for Hi-Res Monitors. I knew this comment would pop at some point 🙂 I already have something in the works for high resultion screen handling. I will publish soon and let you know! Please upgrade the package to the latest version (2017.02.01), all screen resolutions are now handled. Your package is a pearl, but since I upgraded to 2017.02.01, only the title bar of the dialogue box appears, allowing no other action than closing it. Default values are still selected on run. I’ve since downgraded to 2017.2.0 and it works like it used to again. My main monitor is the 3000 x 2000 200% scaling, If I set the monitor anywhere greater than 150% scaling the dialog box is truncated. Do you see any way how i could connect the Springs.SelectLinkedElement node to this? I’ll post to dynamobim,org and add the link here. Yes this can be done. I’ll let you know when it’s available. is it possible to create a second list with mutiple inputs that’s linked to the first list. Example: first list contains a count from 1 to 10, let say that 2 is selected. the second list contains 4 inputs. I want, depening on the count, to make the same 4 choices for every count. 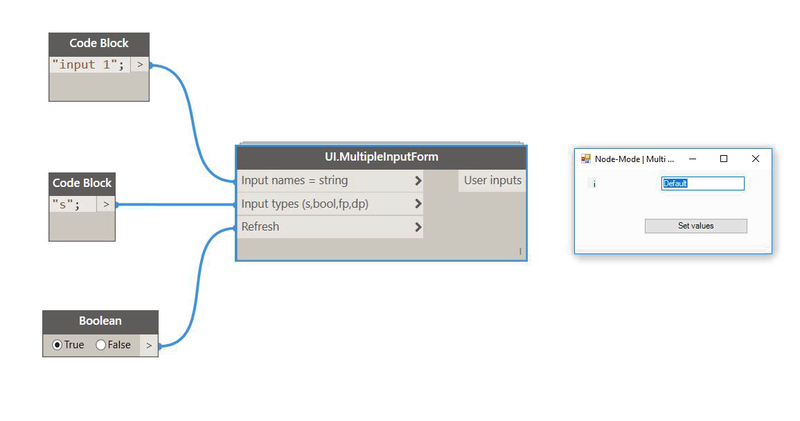 you can achieve that using a sequence of UI.MultipleInputForm++ nodes. The outputs of the first node can be used to alter the inputs of the second form. In order for the sequence to always be run in the same order, you need to use the “was run” output of the first node as a toggle for the second one. i was able to link the first form to the next but i can only fill the second form once en not 4 times as i selected in the first form. Whats missing? Are you after something like this ? Yes, that’s it. Only i am using drop down data. Where can i find the custom node? No custom node here (except for the data-shapes ones of course:) ). I’m just using List.OfRepeatedItem to multiply the UI input node. It’ll work exactly the same with a dorpdown. Wonderful nodes you’ve created. I use them all the time. Can I control where on the screen the interface pops up? It seems to end up on the lower left. Thanks for your help and all your hard work. Using your UI.ListViewData – can I change the distance between the lines? I’m trying to compress the gui down. With all my choices, it’s approaching the height of my screen. Hey Mike, by setting a maximum height for the form (it is an input of the UI.MultipleInputForm ++ Node) you’ll be able to make the form scrollable and make sure it doesn’t get too big for your screen. At the moment from what i can tell the only way to get multiple drop down without knowing the number of drop downs required. Is to use the UI. 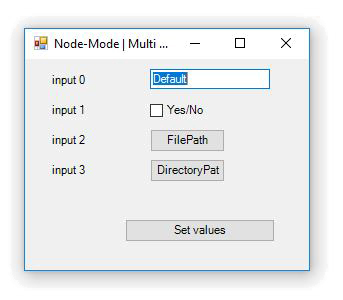 Multipleinput form node. which does not have the width height functionality. Am i correct in my above thinking and if so, are you planning to add these functions to the node? actually UI.MultiInputForm++ will allow you to do that easilly. You can use the lacing on UI.DropDown data to create many dropdown inputs from a list . Let me know if you need an example. Thank you for this interesting node. However, I have a problem. I can not run the program. It makes : execution started but it ends up getting stuck. Normally the result of the node (OUT) is the list that I did enter on the GUI if understand. In your opinion where is the problem knowing that the entries are two drop-down list of 137 items. thanks for very useful tools! Could you look at my post on Dynamo forum?